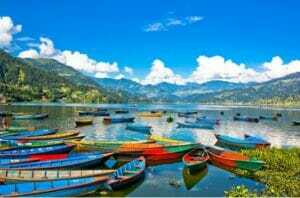 Pokhara is one of the most popular tourist destinations and the second most visited city in Nepal. It is famous for its tranquil atmosphere and the beauty of the surrounding countryside, as well as for lovely Phewa Lake, on whose shores the city lies. Three out of the ten highest mountains in the world can be seen from Pokhara (Dhaulagiri, Annapurna, Manasalu). The iconic Machhapuchre (“Fishtail”), with its distinctively pointed peak, has become the icon of the city. As the base for trekkers who make the popular Annapurna Circuit, Pokhara has developed many interesting sightseeing opportunities. Lakeside, the area of town located on the shores of Phewa Lake. The place is full of interesting shops and sidewalk vendors. On the south end of town, visitors can catch a coloured wooden boat to the historic Barahi temple, located on an island in the Phewa Lake. On a hill overlooking the southern end of Phewa Lake is the World Peace Stupa. From which a spectacular view of the lake, city, and Annapurna Himalayas can be seen. Sarangkot, a hill on the southern side of the lake, offers an exquisite dawn panorama of green valleys framed by the snow-capped Annapurnas. The Seti Gandaki River has created spectacular gorges in and around the city. At places it is only a few meters wide and runs so far below that it is not visible or audible from the top. Temples worth visiting in city include Bindhyabasini, Bhadrakali, Sitaldevi, Gita Mandir and Bhimsen. International Mountain Museum and the Gurkha Museum are also worth a visit. Shoppers will want to spend at least half a day wandering around Mahendraphul and Pritiviti Chowk, where shops number in the thousands and offer a mind-boggling array of merchandise. 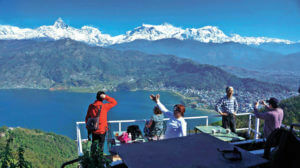 Many tourists plan to spend only a day or two in Pokhara at the end of their trek and, once they arrive, are disappointed that they have not allocated more time. Don’t make this mistake when visiting Pokhara; the city has so much to offer that a week is easily spent here. Contact me today for more information and pricing details about tour packages.